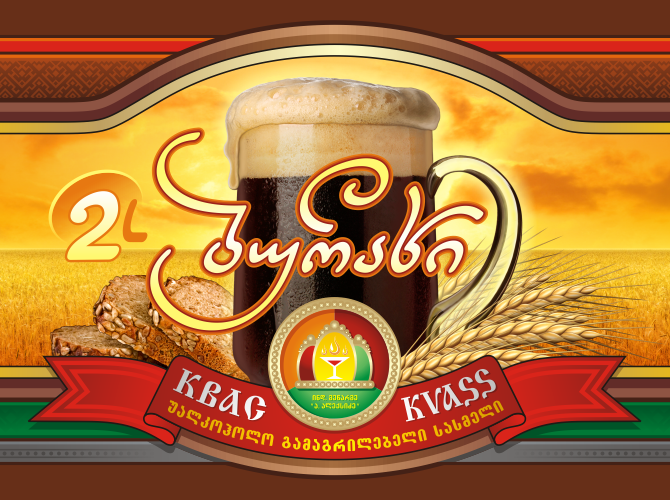 Kvass is a traditional Russian refreshing drink, made of rye bread... wait a minute, this is a Georgian drink we're talking about here. Why would someone make Georgian kvass? Another of life's great mysteries? Well, not really. Fact is, kvass has always been a hugely popular drink in the former Soviet republics and remains so to this day. Nothing much to say about the label itself, though. It's traditional, heavily relies on stock images, with the exception of those rye ears, entirely hand made and assembled in Photoshop by yours truly. Done last summer, for a small Georgian enterprise specialized in non-alcoholic refreshing beverages.